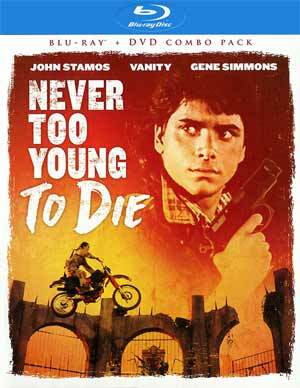 Never Too Young to Die has received a cult following over the past 30 years with my first understanding only a year or two back when it was featured on Red Letter Media’s “Best of the Worst” series. Seeing it in its entirety for myself, it certainly has earned the bad its good moniker. 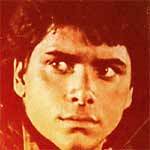 When a top secret agent (GEORGE LAZENBY) is murdered, his estranged son Lance Stargrove (JOHN STAMOS) teams up with his dad’s seductive associate, Danja Deering (VANITY) to face his father’s killer… the fiendish mastermind Velvet Von Ragnar (GENE SIMMONS). The hermaphobic heel is hell-bent on a scheme to poison the city’s water supply – and it’s up to Stargrove to crush Velvet once and for all! The features are a bit light, but we do get an Audio Commentary with Pop Culture Historian Russell Dyball, a TV Spot and a VHS Version where you can watch the film like it’s the 1980s! Inside is also a DVD Copy. 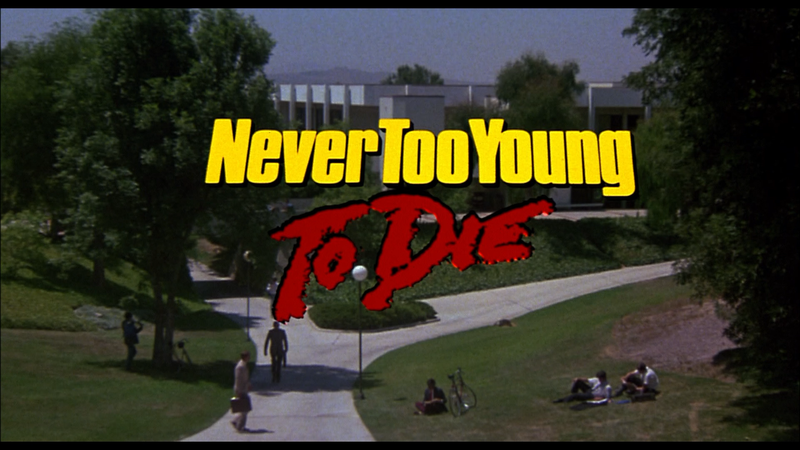 Never Too Young to Die debuts on Blu-ray (and I believe DVD) through Shout Factory presented in 1080p high-definition and in 1.85 widescreen aspect ratio. 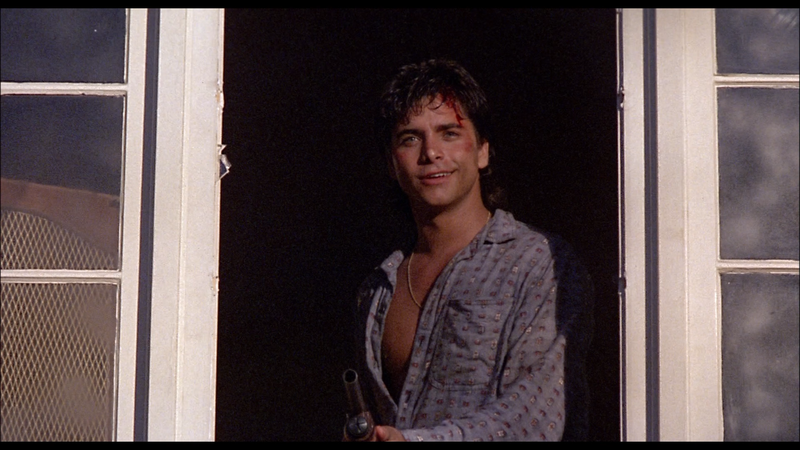 As one probably suspects, this isn’t the most glorious looking HD transfer even by mid-80s standard but still detail was adequate and colors generally bright and although there were some film damage (minor scratches and dust marks), I highly doubt it has ever looked better. The disc includes a quasi-robust DTS-HD Master Audio Stereo track which provides some okay depth when the (inane) action picks up as well as giving off crisp and clean dialogue levels. As with the video, you’re not going to get some superior transfer or one that received the full treatment, yet for fans, the lossless track still sounds pretty good. Overall, Never Too Young to Die has received a cult following over the past 30 years with my first understanding only a year or two back when it was featured on Red Letter Media’s “Best of the Worst” series. Seeing it in its entirety for myself, it certainly has earned the bad its good moniker. 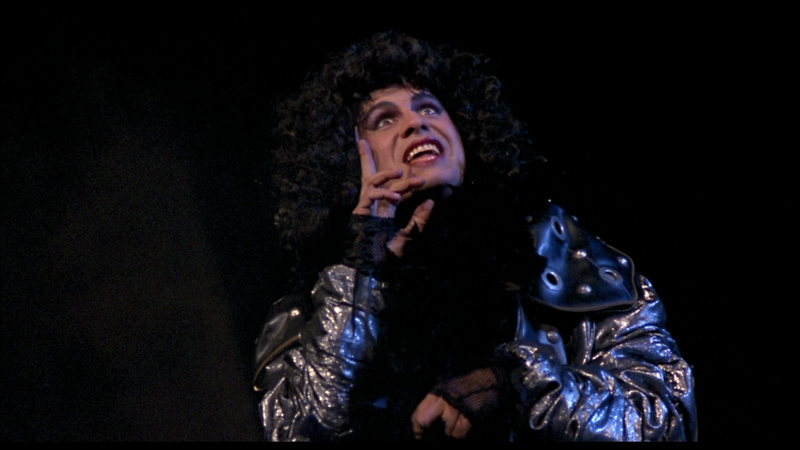 As for Shout Factory’s Blu-ray, it offers okay video/audio transfers but falls short in the features department, but at least has a commentary and nifty VHS version for any old schoolers out there.